A photo of a man harvesting coffee in Batangas in 1927. Image source: University of Wisconsin Digital Collections. The picture above has been downloaded from the University of Wisconsin Digital Collections. 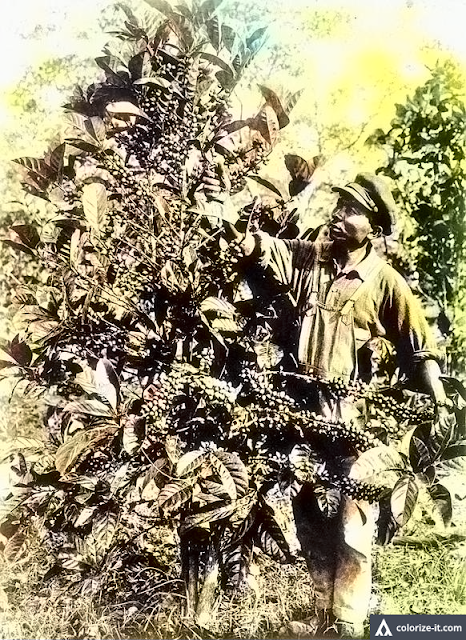 It was originally submitted to the archive by one Alfred W. McCoy and is titled “Harvesting Coffee, Batangas, 1927.” The picture was taken on 12 March 1927 of a man harvesting excels coffee, thought of as a productive variety in Batangas at the time. Exactly where in Batangas the picture was taken is not given, albeit one would suspect that it was either in the then-town of Lipa or its immediate neighbors. Lipa, of course, became one of the Philippines’ wealthiest towns in the late 19th century because of a coffee boom that would, however, turn to bust because of a fungus infestation.